Raffle drawing is this Friday!!! Please turn in your raffles by Friday morning! TWO more families needed to qualify for the $500 bonus!!! We need 2 more families to sign up for Good Eggs and make their first purchase by midnight for us to qualify for the $500 bonus! Please sign up if you have or spread the word! Thanks! Students will be dismissed at 12:50 pm!!! SFUSD schools, central offices and after school programs will be closed, Friday, Nov. 16, due to ongoing concerns regarding air quality both inside and outside of schools and offices. There is a Halloween event Sunday, October 28th at Joe DiMaggio Park from 2 to 5 PM. This is the 11th annual Halloween Extravaganza. Although the Newsletter this week said Garfield will be having a tent at this event, we have had to cancel because we could not get enough volunteers to prepare for the event, set up at the event, and hand out goodies to all the ghost, princesses, and all the other little special guests. However, this is a great event and you should bring your little Trick or Treaters for a great time on Sunday! Walk and Roll to School day aims to make walking safer, more enjoyable, and a preferred way to get around. Please walk, bike, or scoot your way to school the morning of Oct. 10th. We will take a pole of how everyone got to school during morning intake! This fall, 5% of every grocery order you place on Good Eggs will go back to Garfield Elementary School! Enter the code MIGHTYDRAGONS –– click "Shop Now." Add your groceries to your Good Eggs basket and check out. New customers get $15 off with this code and if 20 new customers join the fundraiser, the school gets a $500 fundraising bonus. 5% goes back on all orders in October and November. If you win a flower bouquet, Good Eggs will contact you directly. You must use the code MIGHTYDRAGONS on your order to join the fundraiser. You will see confirmation text that reads "You're supporting Garfield Elementary School!" at checkout. If you use another code at checkout your order will not be counted toward the fundraiser. Once you've used the code on an order, it will stick in your basket through the fundraising period –– no need to enter it again. 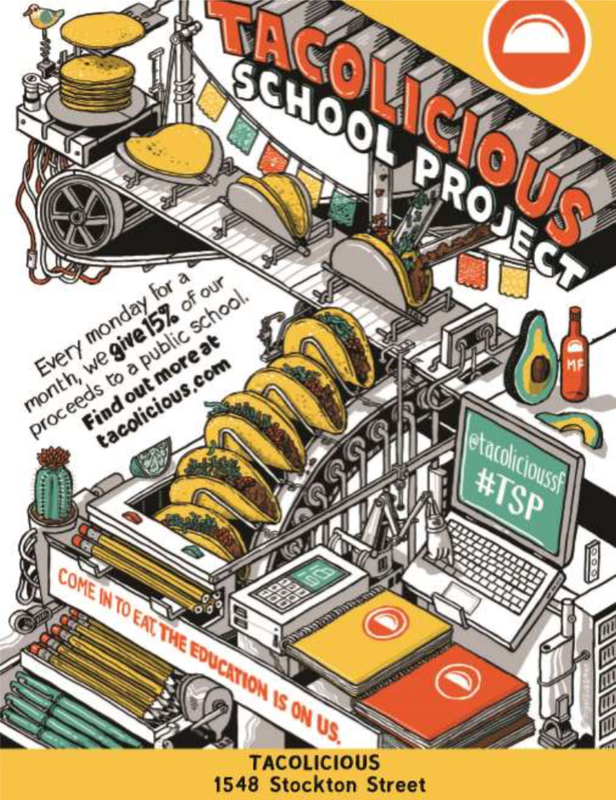 Every Monday this September, our neighborhood restaurant, TACOLICIOUS, will donate 15% of all proceeds to GARFIELD Elementary. Come support Garfield. Enjoy drinks, lunch, dinner, or take out with your family and friends from TACOLICIOUS – 1548 Stockton Street @ Union St. in North Beach.